Did you know that they have Alligators in Arkansas? Me neither. But they do, check it out! Apparently they have them in Oklahoma too! Who knew!? But we are not here to talk about Oklahoma Alligators. 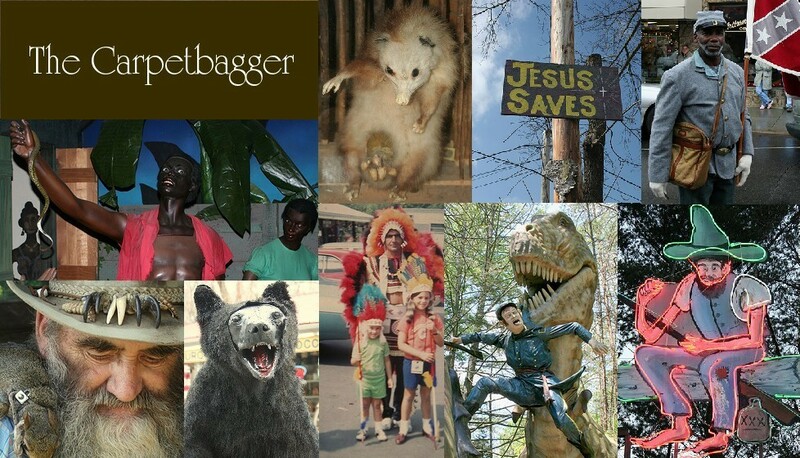 We are here to talk about one of the oldest operating tourist attractions in America: The Arkansas Alligator farm, which was opened WAY back in 1902 and still showing off Gators to this day. 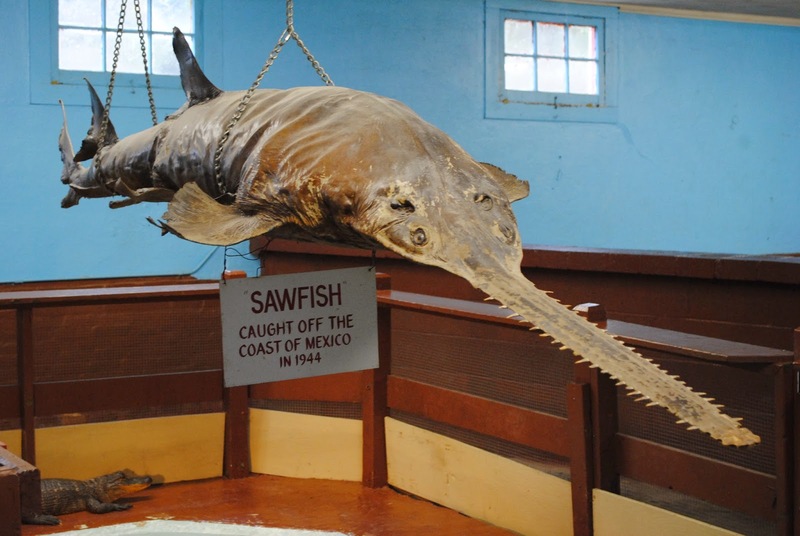 Now this is the sort of attraction that one would expect to find in Florida, and it seems like someone plucked it up and dropped it in Arkansas, but as the above maps shows Alligators DO live in Arkansas and this attraction opened its gates FORTY SEVEN years before Gatorland. 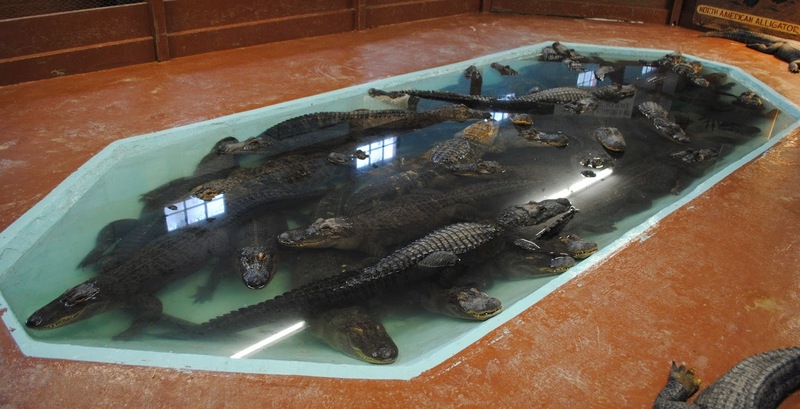 This attraction features only Native Arkansas Gators. This is about as old school as you can get with roadside animal attractions. When you enter you are immediately greeted by Charlie then Parrot, who really hates men and children for some reason. The lady at the counter told me he doesn't really like women either. With the cost of admission I was given a few slices of bread to feed to the animals. There were some sheep, goats and Donkeys who were more then happy to murder me for bread. They also some Emus, mountain lions, and some very angry wolves. They also had a highly violent Racoon. Apparently, the theme here is animals that hate people. Actually, this poor guy looks like he would never bite anyone. Of course I visited in late November so the Gators were not outside. This isn't Florida after all. One strange thing of note is this bizarre monument. Why was someone letting their dog run loose in an Alligator farm? Why would someone want to commemorate this moment? How did they get the dog's remains from the alligator? Seriously, isn't this just plain bizarre and morbid? 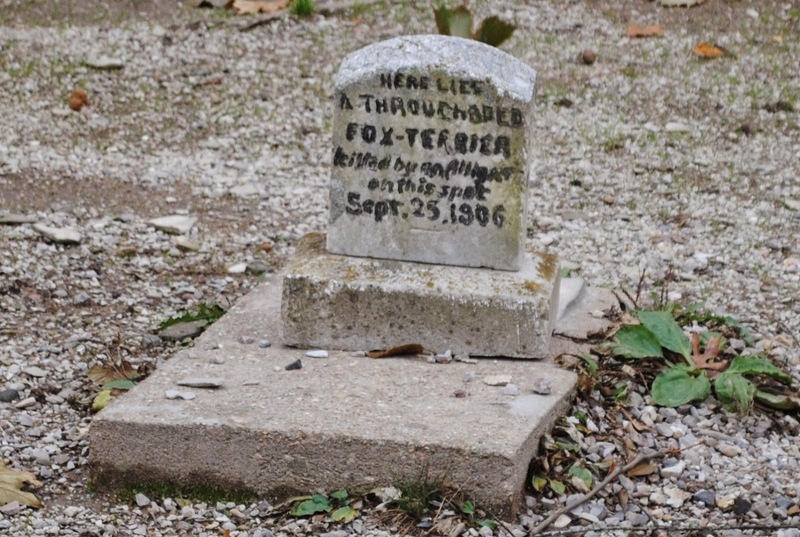 Anyways, we didn't come here to mourn the lost of a dog that has been dead long before my grandparents were born. We came to see Alligators. This time of the year the alligators are in their "Wintering Quarters" which was a big cinder block building full of shallow pools. Oh yeah, and no Bread allowed in the alligator building. Apparently Gators hate bread. Now, as some may know, I have a huge alligator fan. 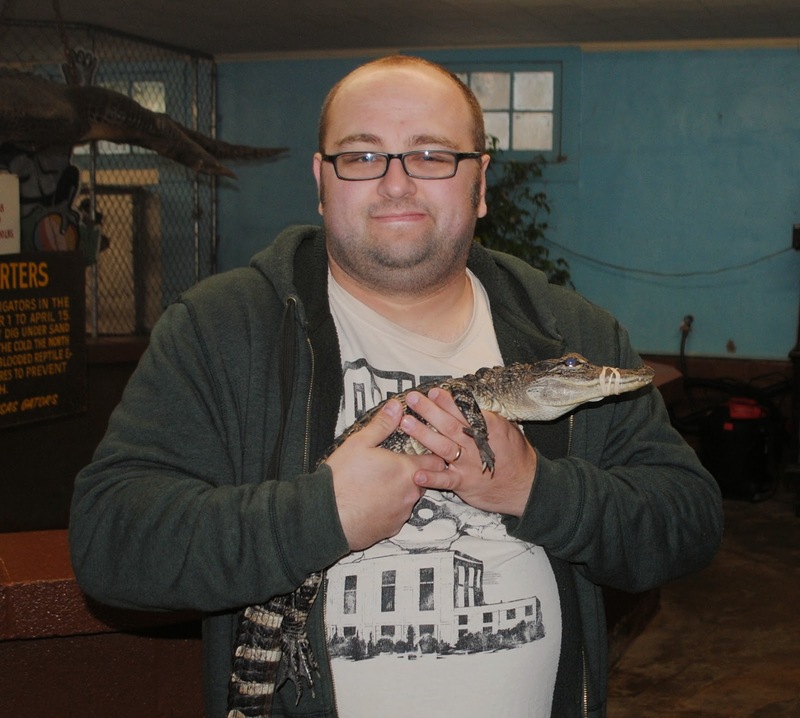 So when they allowed me to hold a baby alligator, I was ecstatic. Rubber bands are like kryptonite for gators. The Wintering Quarters had a few odd bits of Taxidermy. Like this poor unfortunate mangled iguana. 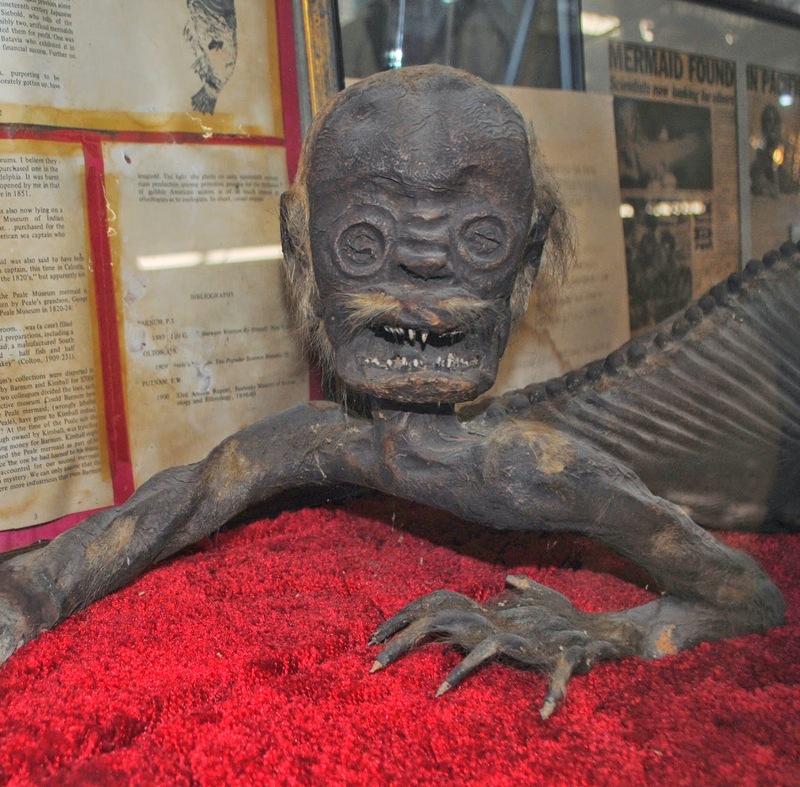 Their bonafide, certified, horrifying Fiji Merman! This isn't just your average everyday merman, either, this guy is the real deal, over a hundred years old and this sucker is HUGE. The man that attended to the alligators said that Ripley's has offered the farm hundred's of thousands for it and they have always turned it down. I have seen a lot of Mermen, but I think this is my new favorite. I also love that he is in his natural habitat: a roadside tourist attraction and not some museum (Don't get me wrong I love Ripley's, but this is were these sort of things truly belong). Now, for a full video of walkthrough of Arkansas Alligator Farm click below. You'll get to see me get attacked by a bunch of goats.